Wouldn't this be a fun sidewalk... specially if you have children. 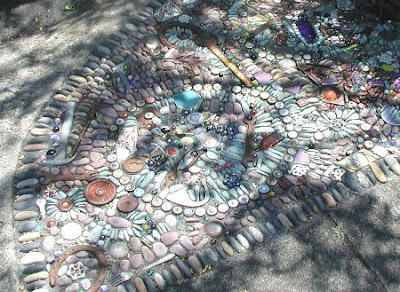 It could be modified by using a plain concrete sidewalk with only the head ... and perhaps the tail... shaped to resemble a snake and trimmed with mosaic. I love this patio area and thought some day I'd have a similar one, but never got around to it... don't think I could build one today. I collected a bunch of flat pretty colored rocks... though... who knows. Maybe. These are live trees... Berkeley, CA! 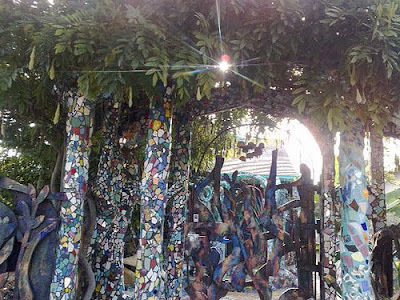 It seems the mosaic would not be able to hold up... wouldn't the tree's growth force the tiles off? Birdie Hot Tub! 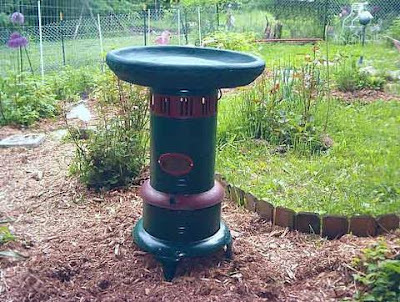 An old heater married to a bowl to create a bird bath. 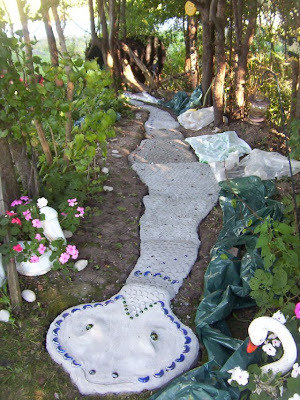 That snake sidewalk is cool, but my sister would never step foot on it. She hates snakes, even fake ones or anything that resembles one!! LOL! Interesting photos. I am not a snake fan (too many encounters with rattlesnakes when I lived in the country), so I will pass on the sidewalk. wowww I love all that mosiac work.. I really need to take a pic of the low size to me and my wheelie water faucet that my hubs did for me. And my son decorated for me.. with glass pieces. I still have other faucets to decorate.